When our team at Chroma Marketing Essentials is developing a strategy for your new website, we aim to incorporate elegance and user-friendly best practices while utilizing the power of up-to-the-minute technology. BeTheme by Muffin Group allows us to translate your ideas and needs into a user experience that will dazzle your clients and give them an intuitive and easy-to-navigate experience that quickly turns visitors into leads. We love that BeTheme is one of the most feature-rich WordPress themes available. 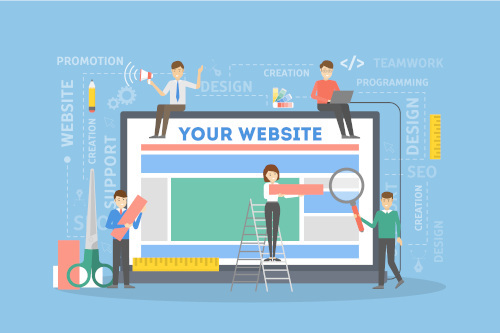 Whether you need an agency homepage, creative portfolio, an online store, blog, or any other type of site, it can be built with BeTheme, This powerhouse of a theme allows us to utilize a wide array of custom widgets and plugins to optimize your users’ experience to meet your business goals. BeTheme gives our developers a leg up on quickly building websites with its demo layouts. These preset building blocks are already set up with slick transitions and filler content, allowing our team to quickly demonstrate how each section of your site will and function. A pre-built layout, however, will never be shipped with a final product launch. At Chroma, we are all about you, and you are unique, just like each site we build. We customize your site colors, fonts, headers, features, functionality, and other design elements to your brand specifications. Though it’s worth saying that BeTheme’s pre-built layouts can still give you a site that looks good and functions well if you’re someone not interested in customizing a site much. BeTheme is entirely ready for retina displays, delivers mobile compatibility to look beautiful across all devices, provides slick css animations for content as you scroll down screen, and allows us to create impressive slideshows and video backgrounds to catch your clients’ attention. BeTheme includes e-commerce support for online shops, and Muffin Group provides a lifetime of automatic updates for BeTheme, keeping your site up-to-date and secure. BeTheme’s remarkable array of powerful features and customizable elements make it a great value for Chroma Marketing Essentials’ clients. Interested in learning more about Chroma Marketing Essentials and how we deliver award winning websites? Call us today at 724-523-3001, or visit our Contact Us page. We look forward to serving you with all your web and online marketing needs.